A couple of days ago Springfield Armory sent us the new XD Mod.2 in 45ACP so we could compare it to the 9mm Mod.2. 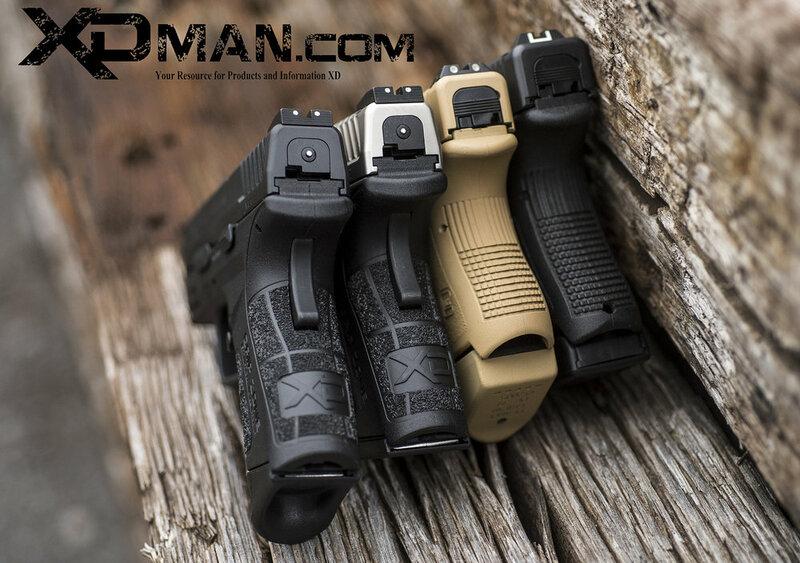 Back in December we published our article on that pistol which you can see at our sister website: www.xdman.com/xd-mod2. It is still my opinion that Springfield & HS Produkt hit a home run with the Mod.2. They did just enough in the right places to refresh an almost 15 year old design with common sense upgrades. The result was a more comfortable and easier to use combat pistol. Not resting on their laurels at the 2015 Shot Show and just a month after first releasing the 9mm version of the mod.2, Springfield announced the 45ACP XD Mod.2. Just like its predecessor, this new slightly larger pistol also set out to impress. Its outward appearance and upgrades are the same as what we wrote about back in December for the 9mm Mod.2. The new pistol slightly larger with a 3.3 inch barrel and larger frame to accommodate the larger 45ACP round. This pistol can use the same legacy 45ACP magazines that the Classic XD & XDM pistols use. The pistol comes with one 9 round flush fitting magazine and one 13 round magazine with an X-Tension. Springfield has corrected one of my biggest complaints of the 9mm Mod.2. In the original Mod.2 the X-Tension did not match the new ascetics of the new frame and was a combination of new and old that just did not match. With the new 45ACP Mod.2, the X-Tension matches the new Grip Zone frame and even carries on the finger groves to the bottom of the magazine. To show the size of the new pistol, we set it side by side with the 9mm Mod.2 and its two biggest pistol competitors the Glock 27 (Tan Gun) and 30. We found that even though the 45ACP Mod.2 was larger than its 9mm brother, it ended up being about the same size as the Glock 27 which is a 40 calibre pistol. Even though the grip length on both of the Glock pistols is smaller in height, it is my opinion they are more comfortable to shoot with a plus type magazine that would extend the length. My pinky finger just does not fit with a flush fitting Glock magazine. When you add these extensions they are basically the same height as that of the XD's. The Glock 30 is Glock's 45ACP compact pistol and the slide of the G30 is obviously longer and wider than that of either of Mod.2 pistols. Therefore, that advantage would go to the XDs as well. Even though we can't call the XD Mod.2 45ACP Springfield's smallest 45ACP, that distinction goes the the 45ACP XDS. It is pretty small especially since it is a true double stack 45ACP pistol. Even with the flush fit magazine you are getting 10 rounds of 45ACP legendary stopping power vs the XDS 6 total rounds. That wide body is also more comfortable to shoot and does not seem to beat up on your hand as much as the XDS does with its thinner grip. The work that Springfield and HS Produkt did to sculpt the ergonomic grip just seems to even distribute the forces from recoil throughout your hand. No two shooters are alike and once again springfield is doing a good job of expanding their inventory options. The XD 45ACP Mod.2 has an X-Tension that matches the new Grip Zone of the Mod.2 pistols.